You are buying Enfamil Enfagrow Next Step Powder Toddler Formula 24oz Vanilla Each, Model #4735783. ADW Diabetes offers a complete line of Enfamil baby formula products both in liquid and powder form. We offer these items in both single and discounted bulk quantities for your convenience.At ADW Diabetes, we offer fast shipping, great pricing, and excellent service on all of your baby formula and health care needs. The Enfamil Enfagrow Next Step Powder Toddler Formula 24oz Vanilla is part of Enfamil Staged Nutrition, along with Enfamil Newborn, Enfamil Infant, and Enfagrow Toddler Transitions. 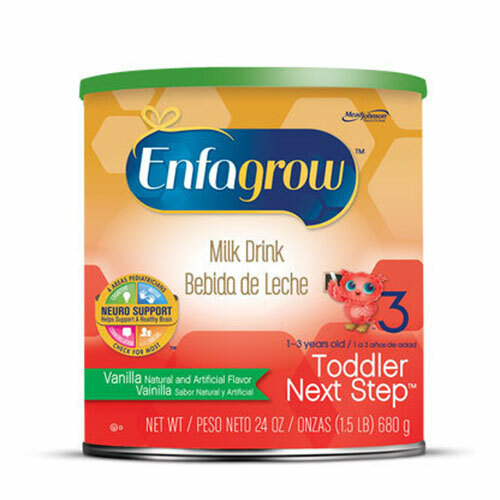 Enfagrow Toddler Next Step Powder is specifically designed for toddlers 1-3 years to help ensure they get good nutrition for their changing needs and tastes. *Protein is incomplete since it does not contain the essential amino acids isoleucine, methionine, threonine, and valine. Nonfat Milk, Corn Syrup Solids, Vegetable Oil (Palm Olein, Coconut, Soy, and High Oleic Sunflower Oils), Sugar, Galactooligosaccharides*, Polydextros*, and less than 1%: Magnesium Phosphate, Calcium Carbonate, Ferrous Sulfate, Zinc Sulfate, Manganese Sulfate, Cupric Sulfate, Natural and Artificial Flavor, Tuna Fish Oil(DHA), Ascorbic Acid, Niacinadime, Ascorbyl Palmitate, Calcium Pantothenate, Vitamin B6 Hydrochloride, Thiamin Hydrochloride, Riboflavin, Vitamin D3, Folic Acid, Biotin, Vitamin E Acetate, Vitamin A Palmitate, Soy Lecithin.